This is a save for a rainy day photos…. I paid 11 US Dollars or 5400 CFA for this map of Togo. It is not 90 percent trash, and 10 percent ok to use. I have torn the map up into four sections; I am tearing up the map. Why, because I wanted to preserve sections of the country I have not visited. Every time I open the map, fold the map, stuff the map into my backpack, I slowly destroy the map. In an effort to save the portions for future use, I decided I need to tear it into pieces. Now, I thought, I should have done this day one. I am going to tear my map up before I destroy them and not after. I can store the good portions of the map until I need them. The daily usage of a map destroys a map, by cutting into separate sections I think I can elongate the time of a map. Note, any person traveling for two weeks does not have to worry. 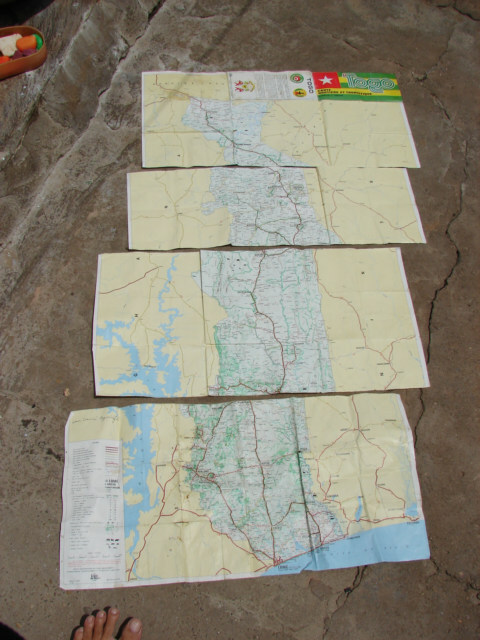 I like my digital on the computer maps, but they are next to worthless when I am in the middle of the road and lost, I need paper. One good option is to print out copies of sections of a country and carry. Tear it up before you destroy it. This map cost one third the price of my guidebook, this is a travel budget expense, the guidebook has maps also, and the reason to buy a guidebook.